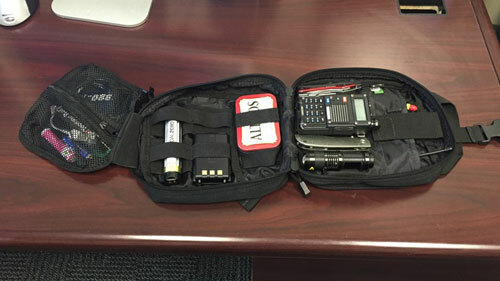 The term "EDC Bag" or "Every Day Carry Bag" is not unique to Amateur Radio. Preppers use this term for items carried on the person every day such as survival items or self defense items. You do not realize it but everyone has an "EDC" items. It's the watch you put on, your car keys, your wallet, your phone, your work bag. Moms of little children have quite the elaborate EDC bag more commonly known as the diaper bag. So in this list, I combine the standard EDC survival items, add in some Amateur Radio items, and modernize it for our urban cell phone toting life. I keep this EDC bag in my work bag then grab it when I go someplace where my work bag does not follow such as ATV riding.